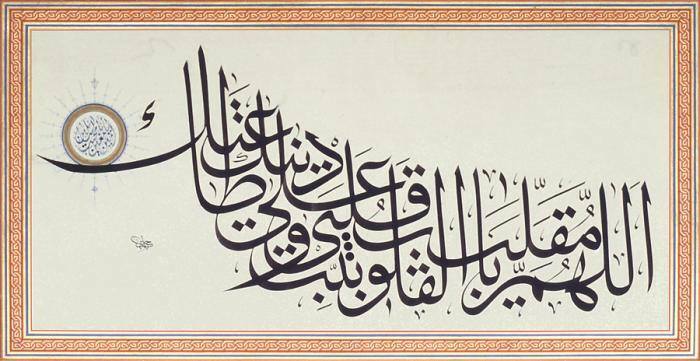 "O You Who changes hearts, make my heart stable in Your religion and in obedience to You." (A prayer of the Prophet Muhammad, recorded in the hadith collection of Ahmad ibn Hanbal; a more highly regarded version of this--recorded in the Sunan of Tirmidhi-- omits "and in obedience to You.") يَا مُقَلِّبَ الْقُلُوبِ ثَبِّتْ قَلْبِي عَلَى دِينِكَ وَطَاعَتِكَ Ya muqalliba l-qulub thabbit qalbi 'ala dinika wa-ta'atika. 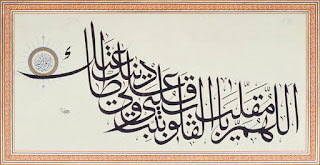 Calligraphed by Hasan Çelebi.